Prevent water from damaging your floors by upgrading to waterproof flooring in Middletown, DE. Our expansive showroom displays a wide selection of flooring options including waterproof vinyl flooring, carpet, laminate, and more. Whether you’re looking for waterproof laminate flooring for your bathrooms or waterproof carpet for the living areas, we’re sure to have something to suit every need. If you’re unsure what type of waterproof flooring is best for your project, feel free to reach out to our skilled and knowledgeable sales and design staff. We’ll discuss your entire project with you and help guide you to the perfect waterproof laminate, carpet, or vinyl flooring to complete your room. COREtec: COREtec floors have a sturdy waterproof core that enhances the resilience of the flooring and adds many years of performance. 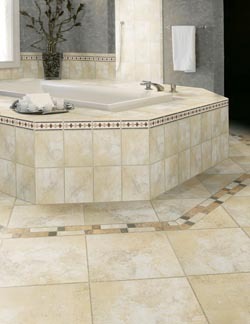 When you’re looking for waterproof vinyl flooring, COREtec is a leading name in quality as well as style. Shaw: Available in waterproof carpet and vinyl, Shaw floors are another trusted brand in waterproof flooring. Whether you’re looking for the comfort of carpet or the sophisticated appearance of wood-look vinyl, Shaw offers a waterproof version perfect for any room in your home. You may believe that waterproof flooring is only useful in the kitchen, bathrooms, or laundry room, but the fact is that it’s incredibly useful throughout the house. Even upper stories or attic rooms can benefit from waterproof carpet in the event of a roof leak after severe wind and rain. Finished basements are another area that benefit from waterproof flooring, especially during floods and heavy rains that can cause flooding. By outfitting your whole house with water-resistant flooring, you can prevent damage to your subfloor, mold growth, and discoloration to your flooring from water damage. Once you’ve chosen your stylish and durable new flooring, be sure to schedule waterproof flooring installation with one of our skilled professionals. We make sure to properly remove your old floors and install the new waterproof floors so they last for many long years. Contact us to schedule waterproof flooring installation with a skilled professional. We’re proud to serve clients in Middletown, DE, as well as the surrounding areas.